In 1989, Jerry Jones purchased the Dallas Cowboys for $US140 million. The sale marked the first time anybody had ever paid more than $US100 million for a sports team and it came just five years after the previous owner, H. R. (Bum) Bright, had purchased the Cowboys for $US60 million. But if there was any thought at the time that Jones overpaid for a team that went 3-13 the year before, that has since been erased, several-fold. 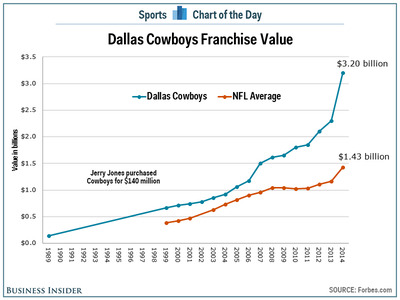 In the 2000s, the value of the Cowboys franchise hovered around 30-60% more than that of the average NFL franchise. 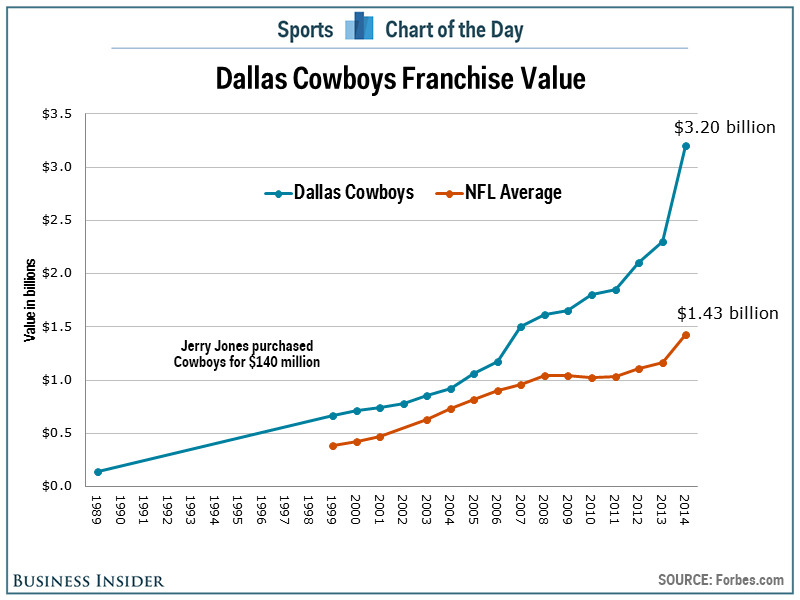 However, over the last five years, the Cowboys valuation has nearly doubled from $US1.65 billion to $US3.20 billion while the average franchise has increased just 36.9% from $US1.04 billion to $US1.43 billion. Jones may not be the best general manager ever, but he is doing something right as an owner.